Good morning! 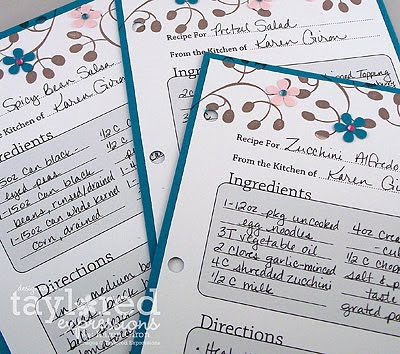 With the holiday season quickly approaching, I thought it would be fun to make a little recipe book with a few of my all time favorite dishes and to get started, I downloaded these fantastic recipe cards from the TE Store and they are the perfect size to slip into the Mini Binder Box! After I printed the recipe cards on Choice Snow White card stock, I cut them to size and added a little colored card stock matte behind it. I stamped the vine image from Celebrate Life in Memento Rich Cocoa ink and then added a few flowers and rhinestones to dress it up a bit. The Mini Binder Box is decorated with a sheet of Sweet Pea paper along with a felt flower and the binding title is made from some glitter stickers. I hope you enjoyed my little recipe box and I'll leave you with all 3 recipes that are sure to bring smiles! Heat the oil in a skillet over medium heat. Stir in garlic, and cook 2 minutes. Mix in zucchini, and cook 10 minutes, until some of the moisture has evaporated. This is soooooooooooo cute, Karen!! 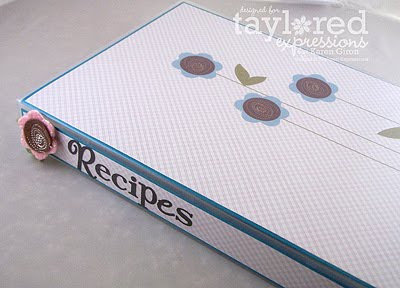 I love the simple cover you created and how you stamped the tops of your recipe cards! Great color combo too! LOVE this!!! Thanks for sharing the recipes too! YUM! BEAUTIFUL Karen! I just adore this!!! YUMM-O!!! The zucchini alfredo sounds yummy and I am definitely going to make the pretzel salad!! LOVE this box, Karen!!! Yum, Yum, Yum! great recipe box! This is awesome Karen!! !I love the colors and all of your recipes look awesome!!!! Thanks for sharing these yummy treat recipes!!! Nice photos you have presented at this blog.I just came to your post and reading above thing it is very impressive me and it is very nice blog. Thanks a lot for sharing this. Those of us who love cooking make it our goal to fill our recipe card box with as many recipes as we can. Whether or not they are passed down through the family, made by ourselves, or just out of a book, good food is good food! 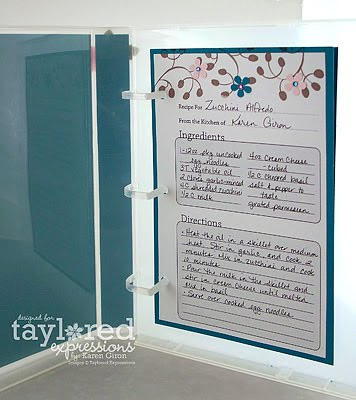 And a neat looking recipe card box can really add to the kitchen.